La Reina est un yacht confortable de 21 mètres, qui propose des croisières au parc marin des Jardins de la reine à Cuba, tous les samedis jusqu'au vendredi, avec un excellent équipage à bord. Il peut accueillir un maximum de 8 personnes, idéal pour des amis proches ou familles désirant faire une croisière de plongée ensemble. La Reina est une croisière confortable, complètement rénové en fin de saison 2005. Avec 21 mètres de long et climatisation, il peut accueillir un maximum de 8 personnes seulement. Le grand pont supérieur, où les repas sont habituellement servis, est aussi un lieu de relaxation après la journée de plongée, avec un cocktail. Il y a un nouveau dessalinisateur qui permet de prendre une quantité illimitée d'eau fraîche chaque jour. Les douches à bord fournissent beaucoup d'eau chaude pour que l'hébergement soit aussi confortable que possible pour nos clients. Le Chef cuisinier sur La Reina, comme sur nos autres bateaux, met tout en oeuvre pour proposer des mets délicieux à nos clients. Les diners sont plus orientés poissons, comme les Vivaneaux Sorbe et les mérous sont facilement disponibles. D'autres plats traditionnels locaux avec du poulet et du porc feront aussi parti du menu de la semaine. Il est très facile pour nous de préparer des repas végétariens sur demande. Le Chef propose tous les jours, divers salades et fruits. Tout le monde attendra avec impatience les délicieux desserts comme le fameux flan local et les gâteaux au rhum. 4 Cabines Twin：Equipées de 2 lits simples superposés. Toutes les cabines ont une salle de bain, climatisation, prises électriques, ainsi que des espaces de rangement dans les tiroirs. 3 plongées par jour, dépendant des conditions météo et du programme. Nitrox：Pas disponible à ce moment. Paiement à bord：En cash seulement (Euro, de préférence). All the cruises start on Saturday and end on Friday. Clients have to be at least one day before in Havana, because the transfer is at 04:00 am on Saturday. Clients will have to spend at least one night in Havana, as we arrive back from Jardines at 09:00 p.m. on Friday. Divers will board at the port of Júcaro. The trip to Jardines de la Reina lasts 5 hours. Lunch is served on board on the way out, and there is time to kick back and relax with a cocktail, or even get a nap before arriving at JDR. Diving schedule is usually at the discretion of the customers following the instructor’s suggestions with 2 or 3 daily dives. The day begins with a wakeup call at 7:00 am, coffee/tea ready, breakfast at 7:15 am. Our diving instructors are ready to go diving from 8:00 am. Fast diving boats are used to reach diving spots having the opportunity to explore different sites each day and enjoy the view of mangrove channels, virgin beaches, birds and other exuberant fauna during the trips. There is no chance for loneliness; dive guides and crew are available every single minute. Our group guarantees all the equipment required to ensure safety (First Aid kits with O2 on every boat, excellent communications with mother boats and mainland, life jackets, etc.). The first morning, check-in dive to get acquainted and make sure all equipment is in good shape. During the briefings, our experienced instructors will explain every detail of the dive, from what will be seen in a particular spot to the correct behavior while diving with sharks or highlights of the area and special characteristics of the marine life present. After the first dive, surface interval in one of the beautiful beaches. Second dive and, at midday, boats will return for lunch. Together with the instructor, arrange time for afternoon dives or for excursions through the lagoon and mangrove channels. Coming back to the live aboard, it is time to drink a frozen “mojito”, enjoy the afternoon pizza and talk about the dives. Around 8:00 pm, dinner is served and, like a family, everyone gets together around the table. The staff will be in contact every minute to assist and receive special requests or suggestions. Evening time next to the bar, to watch photos and videos while breathing the sea atmosphere, it’s time to plan with the instructors what will happen next day. In Jardines de la Reina, our season is year round. A normal week includes 15 dives from Sunday to Thursday; return to the mainland is on Friday. It is possible to book extra dives on request. 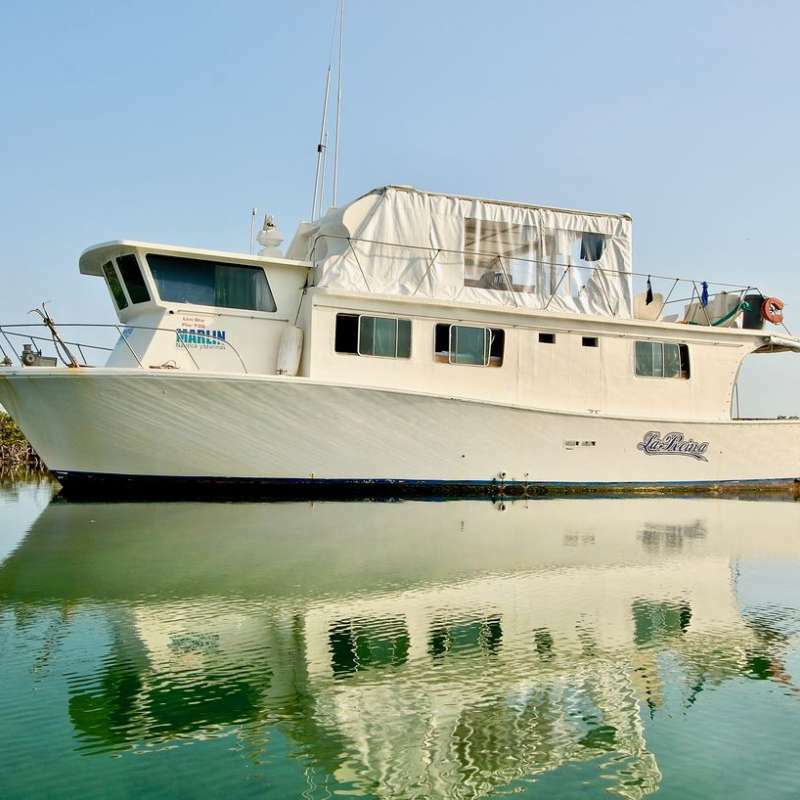 Period : Liveaboards run trips year round. The ocean that surrounds Cuba is full of little unexplored reefs where grouper and sharks are resident and visible all year. Visibility is always between 30m-40m. Visa's : Tourist who travel to Cuba need to get the appropriate visa called Tourist Card and a valid passport having 6 months validy after the return tiket. Depending on your nationality, have a check online with the representative Cuban Embassy or consulate. Climate: the climate of Cuba is semitropical or temperate. The average minimum temperature is 21° C (70° F ), the average maximum 27° C (81° F ). The trade winds and sea breezes make coastal areas more habitable. Cuba has a rainy season from May to October. Water: The temperature of water varies in the limits of 24°-28°S during the year, the coldest conditions are encountered in the winter months from December until February. Flights: Main air gates of Cuba International Airport named of Jose Marti (HAV) is located near Havana. From Havana there are different Taxi and land tour offered at the arrival. Currency: In Cuba two currencies are used - nonconvertible (CUP) and converted (CUC) Cuban of peso. Cuban currency is NOT traded internationally, so you can’t buy it in advance and have to convert once your arrived. Clothing: On diving liveaboard is ideal to carry light air clothing, which also proposes protection from the tropical sun; for the cooler or rainier evenings you can also pack a jumper and light raincoat. Plugs: Joints of the type A/B/C/L, 110V, 60Hz. In the majority of hotels and onboard the liveaboards you will find either 110V or 220V so be aware before plugging our electrics.